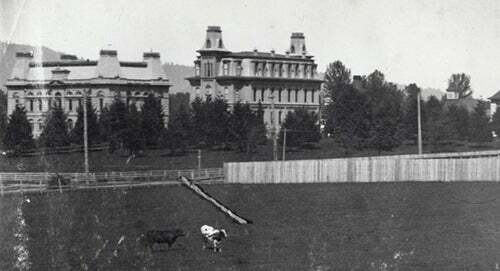 Back in 1859, Congress required Oregon’s founders to establish a public university. That university is us. Oregon’s pioneers were more concerned with eking out a living than in the refinements of higher education. But in the early 1870s, Judge Joshua Walton convinced residents of Eugene City to become home to what would become the fledgling state’s flagship university. Then, as now, our roots were in our community. Farmers sold produce and mules and held church socials to scrape together $27,500, enough to buy an 18-acre piece of ground that became our campus. Construction on our first building began in 1873. 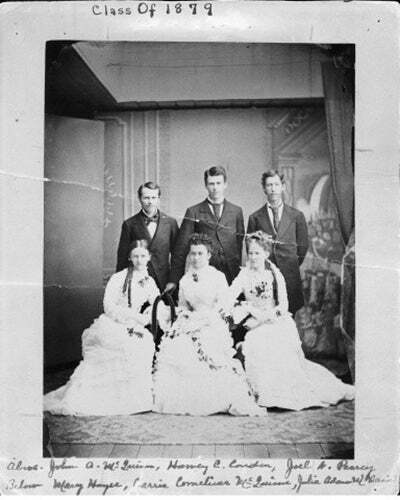 Five faculty members taught the first group of students in 1876. Two years later, we produced our first graduating class: John C. Whiteaker, George S. Washburne, Robert S. Bean, Matthew S. Wallis, and Nellie A. Condon. Since then we’ve awarded diplomas to tens of thousands of young men and women—geologists and writers, painters and chemists, innovators and rule-breakers, lawmakers and dancers, dreamers and doers. We’ve produced eight governors, 18 Pulitzer Prizes, 20 Rhodes Scholars, 13 Olympic medalists, nine Academy Awards, nine Emmys, six NFL Hall of Famers and a Heisman Trophy winner. Today, more than 24,000 students, from all 50 states and more than 95 countries, study at Oregon. But our early years were not without their challenges. We nearly closed in 1881 because of a debt of $8,182. Railroad magnate Henry Villard donated $7,000 to pay it down. We named our second building after him. In 1885, the university received its first appropriation from the legislature, for $30,000. That funding increased to $47,500 by 1901. 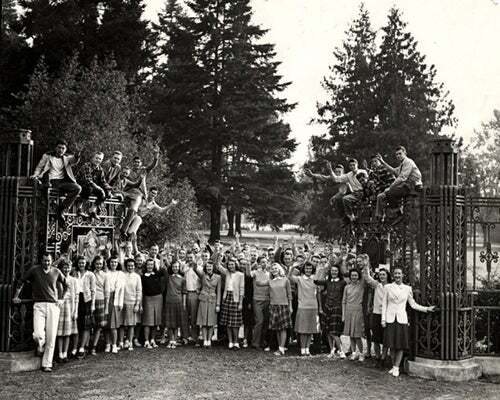 On two occasions, in 1913 and again in 1932, efforts to combine the UO with what is now Oregon State University in Corvallis were thwarted—no doubt to the relief of Ducks and Beavers alike. Enrollment shot up in the post–World War II years, and again in the 1960s, when the number of students increased by more than 70 percent. In 1969, we were admitted into the exclusive membership of the Association of American Universities, an organization of leading research institutions devoted to maintaining a strong system of academic research and education. We’re one of just two Pacific Northwest universities to belong to the AAU. Starting around 1990, state support for the university began to diminish. Today, state funds account for 7 percent of our operating budget. But we’ve always had a pioneering streak. So with the approval of the legislature, Oregon’s three largest universities went their own way with their own governance boards. A 15-member board of trustees, appointed by the governor, took charge of the University of Oregon in 2014. That first muddy 18-acre parcel has grown into a verdant, 295-acre gem, home to more than 3,000 trees. Not to mention brand new labs, residence halls, and soon, a newly remodeled recreation center and student union. But there’s more to the University of Oregon than buildings and trees, books and labs. From that first muddy pasture has sprung an intellectual curiosity every bit as vibrant as our trees. We yearn to ask why and what if. So why? Why this place? Why right now? Because we’re Ducks. And that’s what Ducks do.